Tonight, in what should be a highly publicized “Fight of The Year” kind of promotion, South Florida’s (And BRASIL’S!) 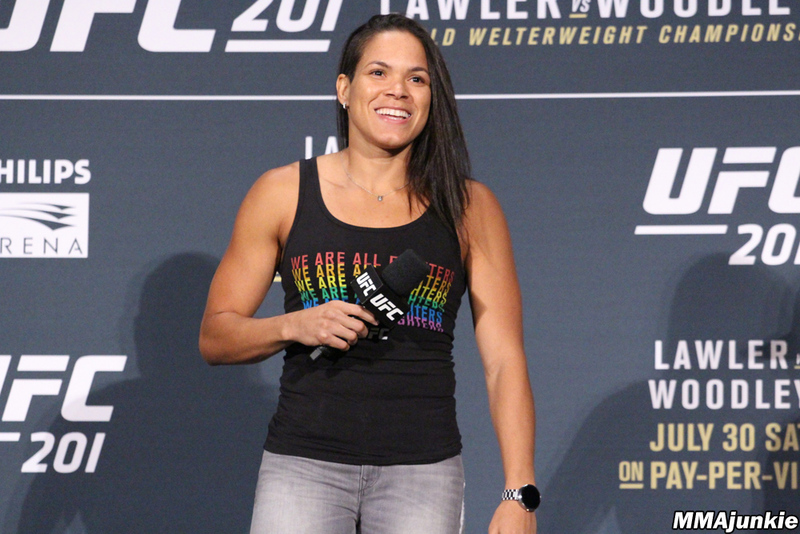 Amanda Nunes takes on former champion Ronda Rousey at UFC 207. The return to the ring of Rousey after her knockout by Holly Holm last November, and after the title changed hands 2 times after that – should be the ‘Sports Story of the Weekend, if not the end of the year (outside of the Bowl Games) but there’s relatively little hype for what should be a big fight. The Reason: Rousey isn’t doing press for the fight. She’s in full on, training/berserker mode and isn’t doing interviews or media for the fight – and the mainstream press seems to be responding to this by under-covering the event. It’s a shame, cause as magnetic as Rousey is, and as much of a star as she is, Nunes is so sweet and charming, that she’d easily win the hearts and minds of casual fans (serious fans already love her). Click HERE for the charmer. The UFC is now owned by WME-IMG and they also manage Rousey (though not Nunes), maybe the fact that Ronda is in focus mode and wants no press around is what they want – hoping to replace lesser known Nunes as champ with the household name (well, in cool households anyway) of Rousey. Half Venezulan Rousey is one of their biggest draws, (when properly promoted) and certainly a marketable one – maybe they are banking on a win, and setting everything back to normal as the UFC train rolls on with its most recognizable stars. One of the coolest things about MMA (sorry Lloyd Dobler, it’s the legit the sport of the future), with stars allowed to show the full aspects of their personalities no mater how un PC they are, with twitter accounts and no Roger Godell style oppressive comish to hold ’em back. They are trained athletes but they fight in a cage – and that’s part of the fun of watching them just be themselves. This great piece CLICK HERE on Amanda before she won the title a few months back really shows who she is as a fighter and a person. As she and her girlfriend (Nina Ansaroff, also an MMA fighter) train and BBQ with friends and hang out. I feel like a traitor even typing this , but one of the great unspoken things about the UFC is the very millennial minded aspect that her sexuality is not an issue, not brought up, just treated as mater of fact. No diff than one would treat Tom Brady and Giselle whatshername. The world of the UFC is beyond that kind of stuff. And frankly, so are its fans. The mainstream media, if it were spoon-fed that story, would make a big deal of it – but instead, Amanda will sport a rainbow flavored UFC shirt without fanfare or pomp , and there’s nothing to it – among real fans or it’s own hype machine – its what you do in the cage and that’s it. We’re all adults here – nothing to see ‘cept a great athlete defending her title. The first openly gay champ in the sport, and that’s not even an issue, or a story, which is sort of the awesomeness of it. (sorry i even mentioned it). The title changed hands from Rousey to Holm, to Miesha Tate, to Amanda in the span of just over a year. That’s cause (unlike boxing) these folks wanna fight. They want the best available, and they are there to throw. There are no padded fights where champs protect their title fighting chumps – this is ‘bring on the best’ always. Partially because in many regards this is a recreational sport. Maybe not for Amanda but for many this is less a way out of squalor than sort of something challenging and awesome to do. As a match up for the champ, Rousey is pure trouble. Just as Holm with her killer reach and kickboxing skill and boxer’s discipline and study was a bad foe for Rousey, and just as Miesha’s grappling was an Achilles heel for Holm, an angry, ready to batter, fast as hell and brutal strong Ronda is a bad match up for Amanda. But – she’s one chill champ. Instead of concentrating on the negatives of an underhyped fight, she’s used the ‘no press’ days to train and prepare. She’s coming in relaxed and ready and in her interviews, pleasant and charming as hell – it’ll be interesting if she’s shocks Ronda and retains the title. And the UFC taps and promotes her like the champion she is. Either way – with RR is ripped, ready and like a bull – should be a great fight. People were waiting for the WNBA or Women’s tennis to explode but women’s sport actually reached it’s zenith of popularity (and parity to men’s sport) with Rousey’s climb to the top. And tonight, vs. a terrific, tough and charismatic champ women’s sport should take it’s place as the biggest story of the night. Yes, It’s undercovered. And as i wrote above, it should be a great fight -but what it definitely is , is a nice beautiful story. I urge you to watch.